“That sounds ridiculous,” exclaimed Rick in disbelief. “It will never work. How could it? It doesn’t make any sense.” Rick suffered from chronic sinusitis. At night when lying down, his nose would stop up, making it difficult for him to breathe and to sleep. The congestion also caused him to experience frequent headaches. The therapy I was telling him about was oil pulling. Although oil pulling has its origins in Ayurvedic medicine, which dates back thousands of years, this modern version is relatively new, at least in the United States. Oil pulling is very simple. Basically all you do is rinse your mouth out with vegetable oil, much like you would with a mouthwash. As simple as it sounds, if done correctly it has a very powerful cleansing and healing affect not only on the mouth and sinuses, but the entire body. Some people think I’m crazy when I tell them that oil pulling can help those with asthma, allergies, chronic fatigue, diabetes, migraine headaches, PMS, and chronic skin problems. Oil pulling works by detoxifying or cleansing the body. In this way, disease promoting toxins are removed, thus allowing the body to heal itself. As a consequence, health problems of all types improve. The first thing that most people notice when they start oil pulling is an improvement in their oral health. Teeth become whiter, breath becomes fresher, and the tongue and gums take on a healthy pink color. Even problems such as bleeding gums, tooth decay, and gum disease are greatly diminished or completely healed. Oil pulling traces it roots to oil gargling practiced in Ayurvedic medicine. Oil pulling as we know it today, was introduced in 1992 by Dr. F. Karach, MD. Dr. Karach claimed that oil pulling could cure a variety of illnesses ranging from heart disease and digestive troubles to hormonal disorders. He said it cured him of a chronic blood disorder of 15 years duration and within three days it cured his arthritis, which at times was so painful he was bed ridden. He used the method in his medical practice with great success. Dr. Karach’s method of oil pulling consists of swishing, not gargling, vegetable oil in the mouth. The oil is “worked” in the mouth by pushing, pulling, and drawing it through the teeth for a period of 15 to 20 minutes. It is done one to three times a day on an empty stomach. The best time is in the morning before eating breakfast, but can be done before any meal. The used oil is discarded and the mouth rinsed out with water. The oil is never swallowed because it is loaded with bacteria, toxins, pus, and mucous. Sunflower and sesame seed oils are the most commonly used for oil pulling, but any vegetable oil will work. People have had success with olive, coconut, almond, and other oils. I prefer to use coconut oil because of its many health benefits. If you use a mild flavored coconut oil it is very pleasant in the mouth. Some oils, such as extra virgin olive oil, are so strong flavored that many people find them difficult to use. The oil acts like a cleanser. When you put it in your mouth and work it around your teeth and gums it “pulls” out bacteria and other debris. It acts much like the oil you put in your car engine. The oil picks up dirt and grime. When you drain the oil, it pulls out the dirt and grime with it, leaving the engine relatively clean. Consequently, the engine runs smoother and lasts longer. Likewise, when we expel harmful substances from our bodies our health is improved and we run smoother and last longer. As simple as it is, oil pulling has a very powerful detoxifying effect. Our mouths are the home to billions of bacteria, viruses, fungi and other parasites and their toxins. Candida and Streptococcus are common residents in our mouths. It is these types of germs and their toxic waste products that cause gum disease and tooth decay and contribute to many other health problems including arthritis and heart disease. Our immune system is constantly fighting these troublemakers. If our immune system becomes overloaded or burdened by excessive stress, poor diet, environmental toxins and such, these organisms can spread throughout the body causing secondary infections and chronic inflammation, leading to any number of health problems. Oil pulling is one of the most remarkable methods of detoxification and healing I have ever experienced in my career as a naturopathic physician. It helped me overcome a chronic skin problem that other forms of detoxification, including numerous juice fasts lasting up to 30 days, were unable to cure. Oil pulling can work its magic almost instantly. Some people report relief from certain conditions after doing it only once. Minor problems often clear up within a few days. More serious, chronic problems may require a few weeks or several months or more depending on lifestyle issues. Toxins are pulled from the body the very first time you try it. One of the first cleansing symptoms you will experience is an increased flow of mucous from your throat and sinuses. Mucous drainage is one of the body’s methods of removing toxins. While you are pulling, mucous may build in the back of your throat. You may even have to expel the oil and clear the mucous from your throat before reaching a full 20 minutes. That’s okay, take another spoonful of oil and continue until you’ve pulled for a total of 15-20 minutes. You may also experience a little nausea and perhaps even need to vomit as your body expels toxic waste. Other symptoms may also arise temporarily. These symptoms will subside as your body becomes cleaner and you become more comfortable with oil pulling. Unlike other methods of detoxification that last for only a short time, oil pulling should become a regular part of your daily schedule, like brushing your teeth. Oil pulling is incredibly effective in brightening teeth, healing gums, preventing bad breath, quenching inflammation, and healing oral infections. It is also effective in treating many systemic conditions throughout the body. As good as it is, the simple oil pulling method described in this article isn’t always enough. Some people and some conditions require a little extra care. For this reason, I took oil pulling and developed it into a more complete, more effective method that I call Oil Pulling Therapy. This program incorporates medicated coconut oil (which you can make yourself), diet, select nutrients, oral pH balancing procedures, and, for those who have amalgam (mercury) fillings or metal crowns, a detox procedure designed specifically for removing heavy metals, all of which combine to greatly enhance the effects and healing properties of oil pulling. The details of this program are covered in my new book Oil Pulling Therapy: Detoxifying and Healing the Body Through Oral Cleansing. 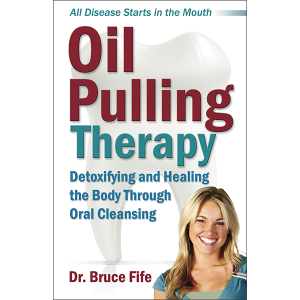 A 4-part audiovisual interview featuring Dr. Bruce Fife, author of Oil Pulling Therapy: Detoxifying and Healing the Body Through Oral Cleansing. In this interview Joyce Riley of The Power Hour radio broadcast interviews Dr. Fife who discusses the many benefits of oil pulling therapy, as well as the correct methods for oil pulling. Includes live testimonials.